My first thought as I'm writing this post is "I hope I don't lose any readers over this." Party affiliation is the most divisive thing in America! It's just unreal. No matter who you were rooting for, remember that I am just like you. I'm a blogger, a daughter, a sister, a dreamer, an American (or at least a resident of Earth). We want what's best for our families; we want to better ourselves, and feel valued in our communities. We need to stop focusing on what makes us different and we need to work together. I'm very proud to say that I live in Washington state. If you haven't already heard, we're pretty damn liberal and we're changing the course of history. We legalized pot, which I never thought I would see in my lifetime! I don't partake of the stuff myself, but I do believe that legalizing it will actually give the government more control over it. If you think about it, when you make something illegal, you actually lose control. Take prohibition for example. Alcohol didn't go away. It just became harder to see and harder to control. Speaking of Prohibition, my husband and I went to Capitol Hill in Seattle to celebrate and, my goodness, was it packed! It looked like the night before the 18th Amendment took effect. Everyone was trying to get into the bars with TVs so they could watch the election results, so the lines were incredibly long. Just at the right moment, we found a table at Big Mario's Pizza and camped out there with 5 or 6 happy strangers. For those of you who don't live in Seattle, Capitol Hill is, for the most part, Gay Pride Central, so you can imagine how jubilant the crowd was. The crowd dancing in the streets numbered over 2000 people! Personally, I can't decide what I'm happier about: Gay marriage passing or Obama being reelected. Victory is my word of the day! And I am so happy for you guys; I wish i could've been there celebrating with you all! You put it very eloquently in your opening paragraph. Hopefully you don't lose friends or blog followers over this - we are all human! So exciting! I am so proud of our state. Marriage equality is SUCH an important issue and marijuana legalization just makes sense. You look adorable! 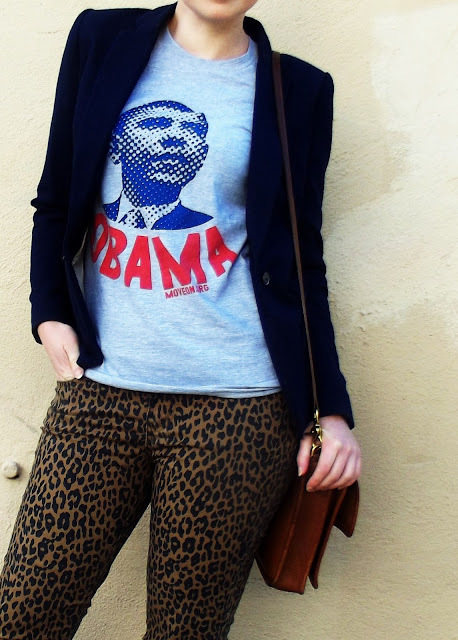 Way to rock the Obama tee in a cute and stylish way. btw, this is my first time stopping by your blog, but it won't be the last. Good for you for speaking your mind! I know posting and retweeting some of the things i did on twitter, i thought would get some fired up, but it didn't. I always find it so weird when i meet conservative people from Washington. It's like, you know where you live right?? Lol. Anyway, love those pants and here's to another four years! I love this look! You have a great style! Your hair! So fabulous. :) As always, Catie! I saw footage of the parties on the news and almost jumped into my car and drove to the Hill. What a great night! I was at Pike and Broadway on election night in 2008 and that was awesome!